Driving back on the Stuart Highway there is a glimpse of a dingo by the side of the road. Suddenly I am not alone. Eyes from another world are watching the car, the dingo's instinct working overtime. Am I friend or foe? Is there food or not? I pull up slowly. The dingo stays within sight. On the boundary of its safety zone. Perhaps to that point where a gunshot could be avoided. He doesn't leave. Maybe it's the possibility of food. Or just plain curiosity. Perhaps he is captive to the DNA that held dingos in human packs. I stay 30 minutes watching him and watching him watching me. He is as motionless in his observation as I am fidgety in mine. Tired of the staring competition I tried to track around to see what happens. As a tracker I make a fair blogger. The dingo "saw me coming" and was gone while maintaining me within his sight and safety zone. I lived as a semi-hermit for many years in a shack in the Megalong Valley, just beyond Blackheath in the Blue Mountains. The area was called the Wild Dog Mountains and at night I could hear the dingos howl. My dog Tommie, part dingo himself, became attentive without joining the chorus. Best that he didn't because dingo howls allow them to register the location of other members of the pack. They would have heard the voice of an intruder. I could never leave Tommie chained either at night or during the day lest the pack attack and kill him as they did with my closest neighbour's dog. Dingos appear regularly in my life. Walkers who trekked on my annual Anzac Day pilgrimage to Splendor Rock in those same Wild Dog Mountains will remember the beautiful, young dingo that joined us as we ascended the ridge. Where else but at the base of Mt Dingo. For an hour or so he acted like a tail-end Charlie before disappearing back into the forest. But here's is the dingo story that most touches my heart. In 1964 I was entering high school. Menzies was introducing conscription to stock Australia's involvement in the Vietnam War with young men. In a terrible year for the armed forces the H.M.A.S Voyager was sunk. As the Beatles sang 'love love me do' on their Australian tour, a group of 20 Martu people were 'coming in' from the Western Desert. They were a mob who had lived traditionally as hunter-gatherers. They had never seen a white man. The Native Welfare officers had been sent to capture them as test rockets were about to land in the Percivale Lakes at the centre of Martu homelands. On the first attempt the terrified mob escaped back into the desert. A car versus nomadic foot chase eventuated and they were finally caught and shipped to the Jigalong mission, 200 kilometres away. They are often referred to as the Lost Tribe. I don't know why. They knew exactly where they were. They knew every waterhole, every animal track and every plant. I am not going to tell you their story. I will do so later when I have driven there in a few months time. For now I will tell you this one.There is a documentary called CONTACT that details the story of the "naked ones". It is beautifully narrated by Yuwali, a 17 year old girl at the time of her capture. Amongst many amazing tales was the relationship between her and a dingo. She tells the story of how the dingo tried to wake her as the whitefella's approached. When they were finally caught and bundled into the vehicles, there is footage of the dingo chasing the Toyota. He chased the car for 30 kilometers until finally stopping and probably dropping dead. Yuwali had recounted all the details of seeing whitefellas for the first time with humour and candour. She had talked of the fear of the evil spirits, the 'divilmen.' The 4WD's were viewed as 'rocks that moved'. But when Yuwali saw footage of the dingo chasing the truck, she broke down uncontrollably ... "my dingo ... my dingo". She was a little girl again and her protector was trying to save her. So if you ever see a dingo by the side of the road think of the tribe who roamed the desert not fifty years ago. Then think of the dingos who kept them warm at night. PS. Incredibly this mob were not the last to come in from the desert. The 'Pintubi Nine' were rounded up in 1984. I intend to drive out to their homeland this winter season. PSS. CONTACT was a film by Bentley Dean, Martin Butler and Yuwali. Here are some links to CONTACT film. 'Captured', 'rounded up', 'caught', 'bundled' and then 'shipped'; Makes you cry! Hi Cecelia. Yep and its true. The physical condition of this mob and the Pintibi Nine was incredible apparently. Guess what Yuwali's job is now. She runs the dialysis clinic. What a statement on the transition from a natural diet to a western one. Yes I saw that film. Terribly sad about the dingo. Sad about people being rounded up like that too. I couldn't help thinking, 'why were they so mean that they didn't let her take him with her?'. Another superb and moving blog entry, Raymond. Am looking forward to following along as you travel to these two sites and more this winter season. Thanks for the links to "Contact" as well. Congratulations on the book deal - such good news. Beautiful story Raymond. You can always trust a dog to show the right way. So sad. Great news about the book deal. I have heard this story before and it always moves me as do so many of the stories of our true history, which brings me to a small sad story of my own. My daughter teaches drama and she wrote a unit that includes some aboriginal content. Believe it or not...even her senior students, young people of 13, 14, and 15 years of age, did not know what a corroboree is. I am totally gob-smacked, as was she. My heart breaks. Anyhow fantastic about your book. I am so excited for you. Congratulations on finding a publisher. I am sure it will be a successful book. Please keep telling us these stories so we never forget the trauma so many families have had to suffer and to recognise the strength of the survivors. I enjoy seeing the photos of the beautiful people you discover.Thanks H.
Thanks for for these stories Raymond, I really appreciate learning of them. I was away from Australia and didn't hear of the encounter and "capture "of the people of the Martu homelands until years later. I did however see "Contact". Hearing of Yuwali and her dingo was very moving. Well done for getting a book accepted for publishing. Then we can hold all these stories together? Hey Cisco. Wandering story tellers. Now I really like that idea Cisco. But I would remind you that you are a New Zealander so "our" heritage might be a bit rich. Cheers Raymond. I grew up on a sheep station on the edge of the Gibson Desert and the Aborigines use to sleep with their dogs at night to keep warm also. 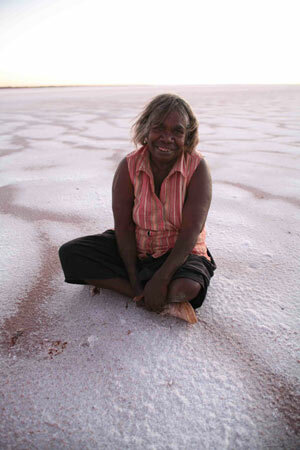 The Aboriginal women taught me a lot about how to find food and water in that dry desolate place. I only wish I'd learned their language too but when you're a silly kid you don't always think about things like that. What a remarkable and touching truth....I admit to tears at this recounting. Thank you for what you share, for the insight and tenderness. I feel such gratitude that in this world a man like you has a dingo like Tommie. Love to you both, sincerely.